Photo courtesy of David Ragan Inc.
David Ragan raised $300,000 for Shriners Hospitals for Children on Thursday night with the sale of the No. 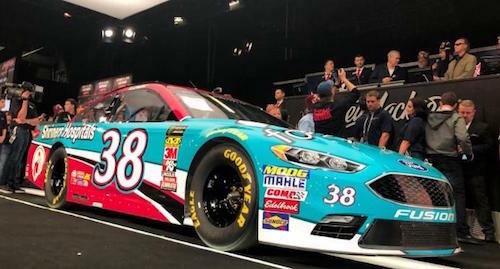 38 Front Row Motorsports Ford he drove in the AAA 400 Drive for Autism Monster Energy NASCAR Cup Series race at Dover (Del.) International Speedway on May 6, 2018. Rick Steele was the highest bidder on the car at the Barrett-Jackson Collector Car Auction in Scottsdale, Ariz. In addition to the car, Steele also will receive four garage passes to the 2019 Cup Series race of his choice. The car Steele purchased carried a special Shriners Hospital paint scheme and was equipped with a four-speed G-Force transmission, a 750-horsepower Roush Yates engine and Goodyear racing tires.